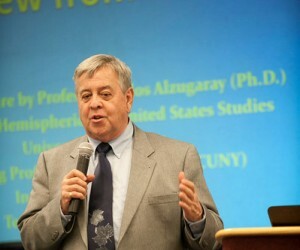 We recently had the opportunity to interview Dr. Carlos Alzugaray, the former Cuban Ambassador to the E.U. and a long time Foreign Service officer. Changes are taking place in Cuba and there is strong evidence that sentiment in the US and Cuba is beginning to shift in favor of normalization of relations. Contrary Perspective was interested in learning more about Cuban attitudes and was privileged to have this opportunity to speak with Dr. Alzugaray while visiting the US. b. traven… Dr. Alzugaray. What one thing do you think Americans do not know about Cuba that they should know? C.A. : There are many but if I could summarize it in one paragraph I would say that Cuba is just another underdeveloped Latin American and Caribbean country whose government and people are endeavoring to build a more prosperous and sustainable society in an environment that is made particularly adverse because the United States Government carries on a policy of unfair, illegal, and unilateral economic sanctions to produce a regime change. Even though we are very close neighbors, Cuba does not represent a threat for the U.S., and the Cuban Government is recognized as legitimate by every other government in the world, including all of the U.S.’s allies. b.traven… What do Cubans think about GITMO and our presence in Guantanamo Bay? C.A. : Cubans believe that the presence of a foreign military base in their national sovereign territory is a result of the unfair relations that we had with the U.S. after the military occupation resulting from the Spanish-Cuban-American War in 1898-1902. When President McKinley declared war on Spain after the USS Maine explosion in 1898, Cubans expected the U.S. to behave as an ally. The McKinley administration, however, treated Cuba as an occupied enemy territory, forcing on the constitutional assembly of 1901 the Platt Amendment that gave the US the right to intervene militarily in Cuba and have bases in its territory. The Amendment was abrogated by both sides in 1934 but the base remains as a reminder of American imposition and obliviousness of Cuba’s independence and sovereignty. b. traven…What is your reaction to the U.S. government citing Cuba as a “state sponsor of terrorism”? C.A. : To be perfectly honest, I do not think that the U.S. has any right, moral or legal, to decide who is or who isn’t a terrorist, much less in the case of Cuba. After all, Cuba has suffered terrorists acts carried out by CIA-trained individuals, like Luis Posada Carriles, better known as the ‘Latin American Bin Laden’, who lives now freely in Miami. Having said that, and recognizing that the list is a political reality, the State Department itself does not make a good case for maintaining Cuba in the list. One of the most obviously unacceptable pretexts used in this year’s report is Cuba’s relationship with FARC (the Colombian Revolutionary Armed Forces). It so happens that the Colombian government has asked the Cuban government to help in its peace negotiations with FARC, which are being carried out successfully in Havana over the last year. The other government involved is Norway, a NATO ally of the U.S.. The presence of Cuba in the list offers the adversaries of normalization the perfect excuse to demand that no negotiations be carried out with Cuba on any subject, even those that are in the U.S. national interest. b. traven…Why do you think Americans are so fearful and disdainful of socialism. C.A. : This is a question for Americans to discuss and decide. Socialism is just a way of organizing the production and distribution of goods and services with the purposes of achieving a fair society. To get there, a society must be both prosperous and sustainable and give all its members the opportunity to make their contribution to their own welfare and the welfare of the rest of society and be rewarded accordingly. In my diplomatic career I have come across countries that have been quite successful in achieving that. Canada and the Scandinavian countries come immediately to my mind. Usually, those countries have combined socialist policies with what might be called capitalistic or market-oriented policies. Americans seem to reject that because they dislike the role of government. Governments can play a positive role. For example, how can there be an efficient economy without good schools, roads and hospitals? And who has the ability and resources to maintain an adequate number of such facilities if it is not the government, be it local or national? b. traven… There are indications that under Raul Castro Cuba will be liberalizing the economy and allowing some outside investment and private enterprise. How extensive do you think these changes will be? C.A. : What is happening in Cuba is a profound reform of the economic and political system. It is very difficult to predict how far we are going to go. I would say that Cuba will go as far as it can to bring about what the Cuban government itself is calling a prosperous and sustainable society. When will this be achieved is difficult to predict for two reasons. The first is that there are transformations taking place in Cuban society that have to do with the successes that Cuba has had in education and health. Younger Cubans are well prepared in terms of their education and, by the same token, expect to be more prosperous and have more autonomy to achieve their personal aims in life. The second reason is that what the Cuban government is doing is a process of learning by doing. They did not start with a well thought out model and they have been developing the mode as they apply the new policies. Having said that, a key turning point will be in 2018 when Raul Castro and most of the older leaders step down after their second term in office and the country’s leadership will be in the hands of a younger generation in their late 40s and early 50s. b. traven… If a normalizing of relations between the U.S. and Cuba takes place, do you feel that the culture of Cuban society may be overwhelmed by American influence? C.A. : No. The ability of Cubans to defend and protect their nation has been very much underestimated. One of the big successes of the Cuban Revolution has been the development of Cuban culture. Music, painting, dancing, literature, the arts in general are going through a Golden Age in Cuba, something that many Americans that visit Cuba understand and respect. Anyone who comes to Havana, for example, is impressed by the very effective and sustained effort done to preserve the cultural historical beauty of the old part of the city. That has been not only a government endeavor. Civil society, through the Union of Artists and Writers and its Architectural Section participated and called to the attention of the authorities which buildings have to be preserved and offered solutions on how to do it. I would say that Cuba is ready to have a better and more intense relationship with the U.S. in which we will not be overwhelmed by American cultural habits. That’s not to say that Cubans will not do what they have been doing historically, accept and assimilate what is good from other cultural identities. b. traven… An American, Alan Gross, is being held in jail by the Cuban government on charges of “destabilizing the government.” Four Cuban nationals are being held by the U.S. on the basis of “spying.” Both governments claim that their nationals are innocent of the charges, yet this situation has become a primary problem in normalizing relations. How do you see this being resolved? C. A.: Let me start by correcting part of the question. Havana has never denied that the four were agents of Cuba. What the Cuban government has said is that it was justified to send them as anti-terrorist agents because there had been acts of terrorism committed against Cuba and its nationals by groups in Miami and the U.S. government’s cooperation was not forthcoming. The main argument of the people who demand that President Obama pardons them is that they could not have a fair trial in Miami (and there is enough evidence to prove that point) and that they were unfairly punished by excessive prison terms, one to two life sentences. There is a difference between the Five (one has finished his sentence and lives in Cuba) and Alan Gross. While the Five came to the U.S. for defensive purposes, i.e. they were anti-terrorist agents, Mr. Gross went to Cuba in the pursuit of a destabilization and regime change. This American citizen was hired by a company that had subcontracted with the U.S. Agency for International Development, from funds designated under the Helms Burton law to undermine the stability and durability of the Cuban government. Gross’s actions in Cuba were offensive and not defensive by nature. Nevertheless, there are sufficient arguments to indicate that the best solution for this issue is for both governments to sit down and negotiate a humanitarian solution that will bring home all the five men. Cuba has said distinctly that it is ready to do that. Up until now the U.S. government has continually refused to do that. b. traven… What ‘downsides’ do you see for both countries if the current situation remains unresolved? C. A.: On the one hand, there is the embargo based on illegal unilateral economic sanctions. It hurts the Cuban people very much, making life difficult for everyone: old and young, woman and man, black and white. But, after 52 years, Cubans have learned to live with those sanctions and have designed strategies to overcome the obstacles that such a policy puts up. It is not ideal, but it is a reality. For the United States it has several draw backs. First, it reinforces the image that the U.S. government is obsessed with Cuba, a very small neighbor and therefore is a bully. Second, it impedes Americans from having a normal relationship with a smaller close neighbor, a relationship that can be profitable to many American businesses and enriching to many Americans who could travel to Cuba and connect with our society. If things normalize the expectation is that between 3 and 5 million Americans would travel to Cuba in the long run. A final problem for the United States is that, as many American experts on Latin America and the Caribbean have accepted, better relations with the region depend very much on the U.S. lifting the embargo and accepting Cuba as what it is: a legitimate and positively active member of the Hemisphere community of nations. For example, few Americans know that Cuba has sent more than 76,000 doctors, nurses and medical assistants to places as far as the Pacific Islands in order to help other countries with their health problems? Not bad for such a small country. The U.S. government’s seething (and unwarranted) hatred for Cuba is nothing short of ridiculous. We trade freely with such nations as China, where abuse of human rights is off the charts. The best places to start are (1) stop all trade restrictions and (2) close Gitmo now and give the land back to the Cuban people.